The hustle and bustle of the city has to happen somewhere. 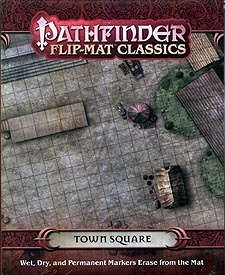 From market stalls to the city gates, Flip-Mat: Town Sq1uare is a perfect set-piece for calming riots, battling invaders, picking pockets, or weathering a siege. The most popular Pathfinder Flip-Mats in history return! These fan-favourite maps feature versatile adventure settings - city streets, forests, ships, taverns, and more - and now they're back for a repeat performance. Durable and lavishly detailed, these essential adventure set pieces are sure to bring excitement to your game table for years to come!